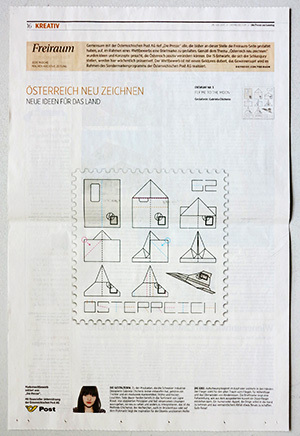 I am very happy to be nominated for the Stamp Competition from the newspaper Die Presse and the Austrian Post. They asked all the creatives that designed a „Freiraum“ page to imagine a stamp. 35 x 35 mm space for creativity. The 15 finalists are presented every week to the readers of Die Presse. End of October a jury will announce the winner whose proposal will be produced by the Austrian Post. So please keep your fingers crossed.